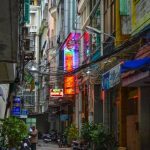 Ho Chi Minh City, formerly known as Saigon, was my first destination after a long flight from London with a stopover in Bangkok. When I left the airport I was hit by a gust of hot air and felt slightly dizzy for the first couple of minutes. Surely it was a sleepless night rather than the heat that caused it? There was no way I could get any rest on that plane. The passengers flying to Thailand were very inconsiderate, overindulging in their whiskey and swearing loudly, did not care about anyone around them. On top of that, an older guy sitting next to me had this very creepy twinkle in his eye when talking about the great fun he has whenever he visits Thai islands. When I jumped on the next plane, this time directly to Vietnam, I was glad I am leaving all these people behind. “Flipping hell! What the crowd? !” – I thought. 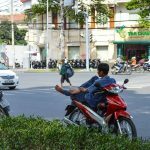 When I arrived at the city centre of Ho Chi Minh City I could not believe the buzz that was surrounding me. 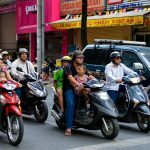 The city was packed with scooters, full of roadside shops, food stalls and it was like a living and breathing organism exploding with energy. I have not felt or experienced anything like that in my life and to say that crossing the road in the middle of it all was certainly thrilling. I immediately fell in love with the fruit stalls full of mango, lychees and a variety of dragon fruits with either white flesh or rich pink one that looked stunning and tasted even better. There were also plenty of fruits I have never come across. 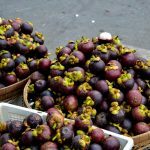 Small piles of mangosteen caught my eye as purple is one of my favourite colours but it was the green papaya, which I tasted later on in crunchy salads, that was the food revelation of this trip. So spicy and delicious! Maria, a lovely intern who used to work with me in London, before my trip on my last day at the office came over to give me a big hug, wish me happy travels and wrote down her contact details in case I needed help from her family in Saigon. It was such a kind gesture. I was lucky to experience and feel similar spirit when exploring the city. A taxi driver called his friend who helped him with English so I could understand how much I need to pay for my ride. A group of students stopped me when I was walking around and offered to point me in the direction of different sites. They were happy that I am visiting their country and curious why I decided to come all the way from the UK. At the end of our chat they asked if they can take a picture with me. I have not slept for hours, my hair due to extreme humidity was at its wildest and curliest but who cared? I had an amazing time, said yes and smiled. 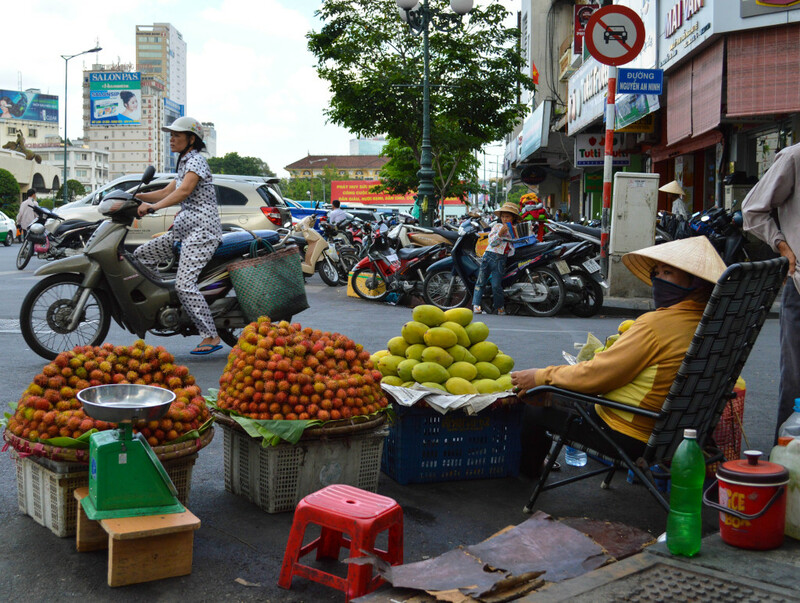 Visit my Flickr to see more pictures from Ho Chi Minh City.